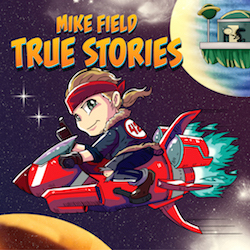 TORONTO - Jazz man Mike Field’s fourth offering True Stories, is a delightful departure from his previous, highly acclaimed albums: it already won the 2018 Independent Music Award (IMA) for Jazz Music Producer and the Toronto Independent Music Award for Best Jazz Vocals. His previous works are Attic Jump, which topped Canadian and international jazz charts plus earned two Independent Music Award (IMA) nominations; Ashes; and sophomore album Rush Mode, which won five Aurora Awards, two Independent Music Video Awards, and was nominated for two IMAs. More often on the road than not, Mike Field writes about what he experiences while touring. True Stories is a mix of experience and fantasy. It's the ultimate musical hybrid, that could fit on a playlist next to Latin, Klezmer, jazz, surf, punk, and novelty songs. The big feature on True Stories, is the unmistakable change of direction and the fact that Field has embraced punk/rock energy and has included his adept vocals. There's a real strong element of novelty with very clever and skillfully written lyrics that convey an infectious sense of fun, and propelled by Field's verbose, rapid-fire delivery. He’s finally singing and expressing himself more fully, and one of the main themes throughout is that he loves the romance and adventure of his life as a travelling musician, where he's at home on the road. "Tu Vuo' Fa' L'Americano" is a high-energy cover of the Neapolitan (not Italian) composition penned by Renato Carosone and Nicola Salerno, and beautifully arranged by Field. Made famous by Sophia Loren in the 1960 film It Started in Naples, and more recently by Rosario Fiorello in the 1999 film The Talented Mr. Ripley, the song is an irresistible, fun-filled, all-dressed slice of Americano vintage rock ’n’ roll with Italiano-café-music crust. "The Ghost And The Paperboy" is more of a swing-style klezmer/rockabilly tune a la Stray Cats, closer to Field's former style and talks about an old man who comes back as a ghost, looking for a new wife. The guitars are more surf than punk on this one and it features accordion riffs throughout. Field’s vocal style and timbre suit the song "Magnolia" perfectly. Somewhere in the high-energy fun zone between wild rockabilly and boppin' big-band jazz, the song features the twangy groove of the former, and the bold, brassy horn charts of the latter. It's a lovely little novelty tune, with killer guitar and trumpet solos, and an all-out vocal performance – in fact, the first to ever be recorded by Field. "Out In The World" is as close as Field gets to a heartfelt pop tune about travelling, and even deeper, about living an artist's life free from the "short leash" of the nine-to-five world. Bongos, shakers, and a crazy organ sound provide compelling sonic touches. "West Side Of Town" features a twinkling piano sound like that of Billy Joel and it’s about Field’s favourite area in his home town. "Autumn Lovesong" is exactly that. A Fall ballad, with piano at its core, this is a bitter-sweet song about autumn, family, and the fleeting passage of time. The IMAs are in their 16th year, they receive thousands of submissions worldwide, and judging panels this year include top recording artists such as Tom Waits, Slayer, Bakithi Kumalo, Michael W. Smith, Sepultura, Amy Lee (Evanescence) and influential press and talent buyers from the Americas, Europe and Pacific Rim. Born and raised in Canada, jazz trumpeter, composer and vocalist Mike Field is known for his bright and energetic music. His works have earned him a series of prestigious awards including the worldwide Independent Music Award for Jazz Music Producer (2018), #1 on the Canadian Jazz Charts (Attic Jump 2016) and the Toronto Independent Music Award for Best Jazz Vocals (2017), He performs regularly in Canada, USA, Australia, New Zealand and Europe, with the odd concert in South Korea, Chile and Antarctica. Whether he's playing one of his standard-like instrumental jazz tunes or singing a silly world-music vocal piece, his music is a mix of fun, technical ability and cultural influences.